King’s has published a technical essay on pages 39-43, volume 73 in Minerals Engineering on Jan. 14 2015, a worldwide prestigious journal focusing on innovation and developments in mineral processing and extractive metallurgy. The paper mainly focuses on a very important topic-wear rate test of the grinding media. As it is well known, lab scale media wear always has close interrelation with its industrial performance. However, two commonly used methods to test the media wear, i.e. self-wear in water and grinding with mineral slurry always can’t get stable wear results. 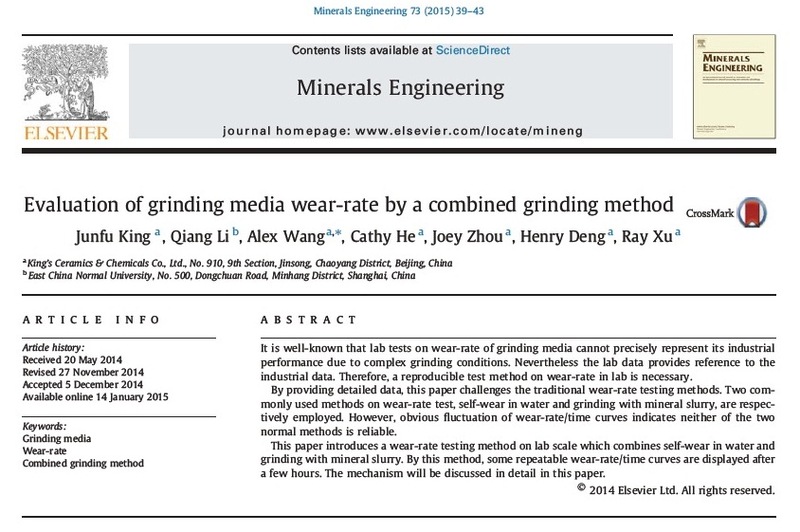 Titled “Evaluation of grinding media wear-rate by a combined grinding method”, the paper proposes a new method which combines the advantages of two above methods to evaluate the wear performance of grinding media. By the new method, repeatable wear rates can be achieved. The mechanism of wear behavior of this new method is discussed in detail in this paper. King’s initial brought this topic and made a technical presentation of “Evaluation of grinding media wear-rate by a combined grinding method” in Comminution ‘14 inCape Town,South Africaduring April 07-10, 2014. After that the paper was submitted to Minerals Engineering in May 2014, and it is officially accepted on Jan. 05, 2015.